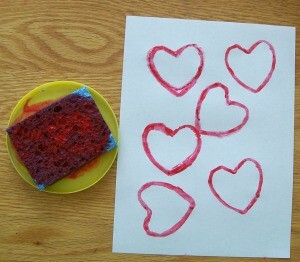 Save some handy tubes from toilet paper or paper towels and use them to make these little heart stamps. Perfect for decorating a Valentine's Day card. This guide contains instructions for making a frugal toilet paper tube heart stamp. Make your own heart stamp frugally from a tissue paper roll. Cut the roll in half, this will make two stamps. Crease them evenly in half, leave one crease as is. The other crease bends inward, this forms the heart. You may have to recrease to get it to stay like you want. Set a small damp sponge on a plastic lid, pour some paint on top. Now you are ready to stamp away! If the paper roll end gets worn down use your second one. Many stamps could be made at once if you save up the rolls. Great for Valentine cards, envelopes, wrapping paper, etc. and easy enough for a small child to do.